BESIDES massive construction and rehabilitation of roads, as well as rehabilitation of hospitals, one other area that has distinguished Governor Udom Emmanuel among most incumbent state governors across the country is his ability to pay regular salaries and monthly pensions despite paucity of funds occasioned by the recession. This explains the cordial relationship between government andworkers in the state unlike several other states where workers continue to threaten work-to-rule due to non- payment of backlog of salaries, and even pensions. Indeed, many are of the view that the governor’s ability to pay off 10 years unpaid gratuity within one year of his inauguration was a landmark. Indeed, his predecessor failed to address the issue for eight years. She said: “There are so many instances to count. If a leader assumes office and then notices that some people were left out for over 10 years without being paid their gratuities and without prompting, clears the entire outstanding, I think that leader has the interest of the workers at heart. And if that same leader within the period of recession, instead of downsizing, he continues to employ, I think he has the interest of the people and the workers at heart. “If a leader with or without federal allocation, pays salaries between the 25th and 27th of every month to workers and one week after, pays retirees; he has the interest of the workers at heart. In Akwa Ibom State, even when you are not promoted, you are not denied your yearly increment. She was quick to admit, however, that the state government is only owing gratuities from where it had stopped, even though it is not peculiar to the state, noting that many states of the federation are faced with similar challenges of payment of workers or gratuities to retirees. “For a state like ours that has not joined the contributory pension scheme, it’s still a problem. For those that have joined, they have backlogs of those who retired before now,” she said. “Government does not owe any person in perpetuity. Salaries are paid including SUBEB – primary school teachers and local government staff. If a worker comes out to say he/she is owed salary, I would ask the worker just as I asked the young man I referred to earlier. There must be something wrong if a worker is not paid. He has probably not been cleared. Until we clear you, we can’t pay you. “I remember when I came on board, arrears of people to be promoted included 2012, 2013 and 2014 and such persons were duly promoted. She revealed that the state was at an advanced stage of ensuring workers own houses, adding that a circular to that effect would be out soon with different ministries being alloted specific numbers they should receive applications from. According to the HOS, the current administration was determined to ensure civil servants own houses which they would be expected to be paying monthly for the next 15 or 20 years as the case may be. Akpan stressed:“This is a state where workers and retirees are taken care of. We are working with the salary consultants. If you retire today, by 12 midnight, your name will be inactive in the integrated payroll and become active in the pension payroll. The HOS disagreed that workers in the state do not receive entitlements even as she stressed that workers are given their entitlements. 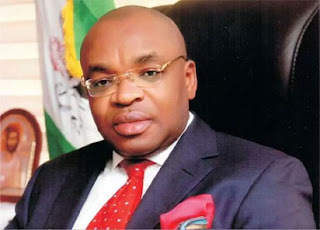 Akpan who said she had been in the know of workers challenges since the creation of the state in 1987 was quick to say that workers would prefer Governor Emmanuel in 2019 given his track record. Things have been done to improve this system over time and we are moving on in all areas – education, agriculture, health, administration and all others. “This administration has tried within its power to do a lot of things. We have had over 20,000 persons promoted within this period. This is beside junior staff in all our MDAs. This is beside promotions in the judiciary and the extra-ministerial departments and tertiary institutions. You know what that will mean if we were to add all of these together. They all have been promoted. I can give you the details of the arrears that have been paid including people that were employed into the service in 2014 and 2015 and were not paid. All of them have been paid. The last batch is coming up in October payment. This is a state that is still paying leave grants. “The arrears we are talking about for the newly employed people we had, 2,249 of them, have now been paid close to N1 billion. Most of them have not informed their people that they have received their salaries. If they are owed one year, they are paid all in one day including the current month. I speak from records that we have,” she stated. *Mr. Ekpeneru, a public affairs commentator, wrote from Lagos.